News outfits are still talking about it. NPR is talking about it. Newser is talking about. Your not-living-anywhere-near-LA aunt is talking about it, if she's into extremely famous houses and very well-known movies and superstar history that stretches waaaay back into the '20s. Oh, and an architect named Frank Lloyd Wright. 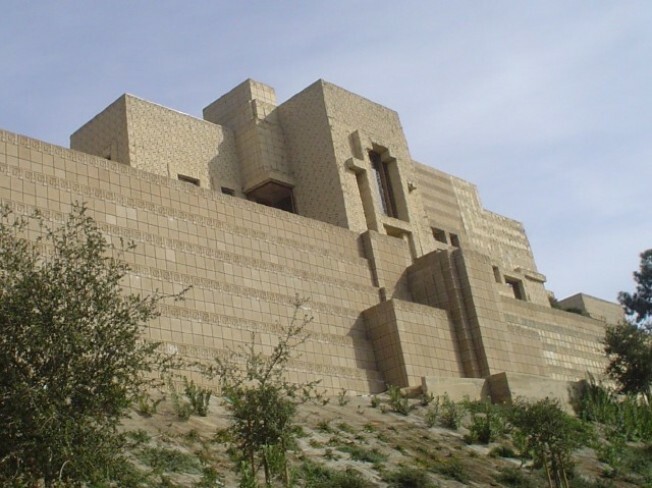 You've heard by now that the ailing, weathering-the-weather, much-looked-after-and-loved Ennis House is up for sale. You know the place. If you've stood at practically any point in Los Feliz, you've seen it, not far from the observatory, not far from the Hollywood Sign. Big, blocky, brown, but a shimmery sand-brown. Around Franklin and Vermont is a good vantage point, we think. So, are you buying it? The wait is almost too much, in that delicious almost-too-much-ish way. What will be the next act for this streetside superstar? It's a treasure, and treasured by many for its place in LA lore, for the fact that it is a major Wrightian landmark, for the reason that movies like "The Rocketeer" and "Blade Runner" were shot within its Mayan-ish walls. "Blade Runner"! The golden ticket of LA moviedom super-flicks, in our sometimes outlandish, often taken-to-task opinion. We're about to name-drop, but we're name-dropping in the most loving, in-memory-of fashion. Forry Ackerman, that dean of B-moviedom, once lived not far from the Ennis House. During one of his famous Saturday morning tours, he stopped our group in his driveway. And then, with his usual flair and drama, Uncle Forry pointed at the famous abode, and told us that "The Black Cat" starring Bela Lugosi and Boris Karloff had been shot back in the '30s in that very house. It was a bit of LA magic. Fading horror flicks and famous addresses and flickering, sepia-ish memories of stars past. We hope the person who signs the papers on this house will love and brag about and covet that hillside beauty, which is truly one of the largest pieces of memorabilia in all of Los Angeles. We think they will. Price tag is 15 million. But consider the "Black Cat" cachet that comes with that. Meow.